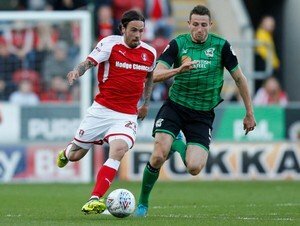 Rotherham United winger Ryan Williams is looking forward to his first trip to Wembley after helping the Millers win in the League One Play-Offs four-two on aggregate over Scunthorpe United. ‘It’s going to be a great occasion,’ the Australian told Radio Sheffield, ‘I’m just dying to get there and see what it’s all about. ‘I almost got spear-tackled when the fans came on at the end! I took a bad tackle in the game too which is why I eventually had to come off but I’ll make sure I’m alright for Wembley. But whether I played or didn’t play the main thing is we got the win. ‘It was a good result but we were under the cosh for the first twenty minutes but I personally think I should have had a penalty. But we scored at a perfect time just before half-time so we went in with a bit of momentum. ‘I’m buzzing for Richard Wood who scored and Will Vaulks was in the right spot at the right time. ‘I don’t think many people would have given us the odds to get to Wembley at the start of the season so we proved a lot of people wrong, now we have to go and do the business. And it is a great achievement there’s no doubting that.